Announced today: Indo-Canadian film director and screenwriter Deepa Mehta will be the guest of honour at this year’s River to River. Florence Indian Film Festival in beautiful Florence/Italy (from December 5 to 11, 2015) – always my favourite movie fest of the year. [She is] most known for her Elements Trilogy, Fire (1996), Earth (1998), and Water (2005); among which Earth was sent by India as its official entry for the Academy Award for Best Foreign Language Film, and Water was Canada’s official entry for Academy Award for Best Foreign Language Film, making it only the second non-French-language Canadian film to put forth for consideration in that category (the first being Zacharias Kunuk’s 2001 Inuktitut-language feature, Atanarjuat), and the first to receive an Oscar nomination. She also co-founded Hamilton-Mehta Productions, with her husband, producer David Hamilton in 1996. She was awarded a Genie Award in 2003 for the screenplay of Bollywood/Hollywood. In May 2012, Mehta received the Governor General’s Performing Arts Award for Lifetime Artistic Achievement, Canada’s highest honour in the performing arts. This year, I was only able to enjoy River to River. Florence Indian Film Festival for five days. But it was my tenth time in a row – and I got to see a particularly fascinating special guest (Irrfan Khan – you can watch more videos of his Q&A sessions here). For the visitors of River to River. 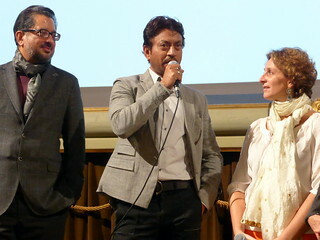 Florence Indian Film Festival Irrfan Khan was the perfect guest: charming, funny and outspoken. I shot some clips during the Q&A sessions for the movies „Qissa“ (with director Anup Singh) and „Paan Sing Tomar“, hosted by festival director Selvaggia Velo. Just announced: Bollywood actor Irrfan Khan will be the guest of honour at this year’s River to River. Florence Indian Film Festival in beautiful Florence/Italy – always my favourite festival of the year. The festival will hold a special tribute to Khan who next appears in Colin Trevorrow’s „Jurassic World“. There will be screenings of his films „Qissa“, „The Namesake“ and „Paan Singh Tomar“, plus seven episodes of the third season of the HBO series „In Treatment“. According to Wikipedia, Irrfan Khan has appeared in more than 30 Bollywood films (as of 2013). 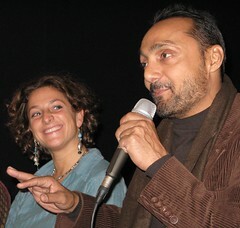 Khan’s English-language mainstream work includes character roles in movies like „New York“, „I Love You“, „A Mighty Heart“, „Slumdog Millionaire“, „The Amazing Spider-Man“, and „Life of Pi“. My final (and favourite!) film festival of the year always is the lovely River to River. Florence Indian Film Festival in Florence/Italy (flickr photo album). This year (2013), its 13th edition will take place from Friday, November 22, until Thursday, November 28, at beautiful Cinema Odeon on Piazza Strozzi, followed by a weekend in Rome (November 29 to December 1) at Nuovo Cinema Aquila, via L’Aquila 68). The programme has just been released today.